If your looking to hire our one of our commercial popcorn machine or candy floss machine with the carts, please keep reading. We offer these supervised or unsupervised. For many years brides and grooms across the country have been hiring popcorn and candy floss machines for their reception. We have some of the best commercial machines on the market today. To compliment the machines, why not hire our pick 'n' mix stand. Our popcorn and candy floss machines for hire can be used for any event including christenings, corporate events and bar mitzvahs. Contact us for a price if you want to hire both machines or package them up with the pick n mix or maybe even a rodeo bull! Our candy floss and popcorn machines will fill your room with a tantolising aroma. You get unlimited popcorn and candy floss (prices based on 2hrs supervision - contact us if you want to hire the items for a longer period). The guests can enjoy their popcorn in a traditional popcorn box like you get at the cinema! The candy floss come on long sticks like what you get at a funfair! We can also offer our machines unsupervised if your looking to save a bit of money or if your just happy to make the food yourself. Prices start from just £99 unsupervised. For more information on hiring our machines on an unsupervised basis, please click either of the following links for more details.. popcorn hire or candy floss hire. If your looking to hire either of these popcorn or candy floss machines with any of our other catering products or rodeo bulls / bouncy castles, please get in touch for a discounted package quote! Every single item on this website is owned by us, we do not outsource any work - which means we can offer some incredible discounts. 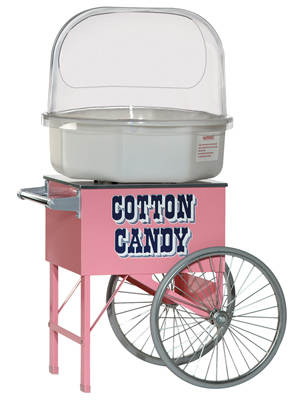 Are you looking for freshly spun candy floss or hot fresh ready-made popcorn for your party, wedding or event? Click on the buttons below for more information.